After a 17 month break, Game of Thrones returned last night and, as expected, a whole lot of people tuned in to watch the HBO premiere. According to the premium cable channel, a record 17.4 million people tuned in last night via HBO’s streaming and linear platforms. The Game of Thrones premiere also helped boost viewership for other Sunday night shows on HBO — Barry, Veep, and Last Week Tonight with John Oliver. 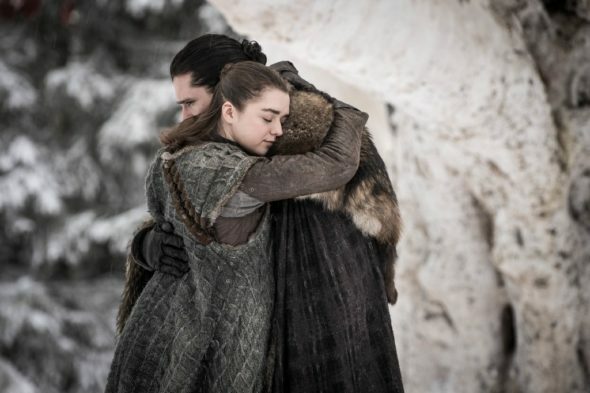 GAME OF THRONES’ final season premiere was watched by a record 17.4 million viewers Sunday night, April 14, across HBO’s platforms (linear, HBOGO and HBO NOW), exceeding the previous series high of 16.9 million viewers for the season seven finale. Compared to the season seven premiere audience of 16.1 million, the season eight premiere grew by over a million viewers. As a testament to the evolving video consumption habits of subscribers, the HBO NOW streaming service saw a jump of approximately 50% in viewing when compared to last season’s finale and nearly doubled (97%) when compared to the seventh season premiere. Yesterday accounts for largest night of streaming activity ever for HBO. GAME OF THRONES’ seventh season went on to average 32.8 million viewers per episode. That viewership will grow considerably over the run of season eight. In addition, the award-winning comedy series BARRY had its largest audience ever, with 2.2 million viewers for the night and 1.8 million viewers at 10:00 p.m., more than quadrupling the previous week’s audience. What do you think? Did you watch the season premiere of Game of Thrones last night? Did you watch it via streaming, on a regular channel, or by some other method? Game of Thrones: Is a Prequel or Sequel Series Possible?